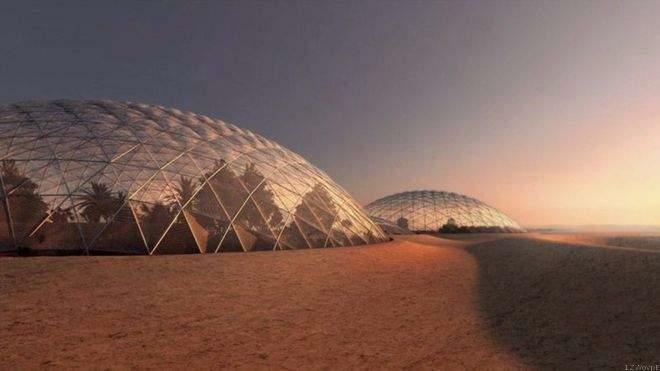 The UAE aims to grow palm trees and lettuce on Mars. UAE is working in partnership with Mitsubishi Heavy Industries - the Gulf state has now announced its space agriculture intentions. The space sector is a huge feature of the Dubai Airshow, with exhibitions, conferences, and speakers that include former Nasa Apollo 15 astronaut, Al Worden. "There are similarities between Mars and the desert," says Rashid Al Zaadi, senior strategic planner at the UAE Space Agency. "The landscape of the UAE, the soil, are similar." And so, the UAE has decided to pump money into two research projects - growing date palms, and lettuces, tomatoes, and strawberries on Mars. "Well, when we get there, we'll have to eat," says Mr Al Zaadi.